Located near the Champs-Elysees, the Petit Palais was constructed for the 1900 Universal Exhibition and is one of 14 in Paris, France. 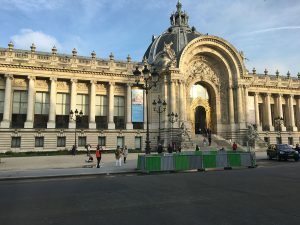 The Petit Palais is well known for housing the City of Paris Museum of Fine Arts, which displays the work of painters like Rembrandt and Greuze. The Eiffel Tower is lit up from within as the sun sets and the moon rises in Paris, France. Built from 1887-1889, the tower stands 1,063 feet tall. stay in France for two weeks from March 8-22 as a part of their exchange program with Savoie University, I knew I had to seize the opportunity. Of course, I would go and take all that France had to offer me. After all, it seemed like a once in a lifetime opportunity that my wanderlust would not allow me to pass up. 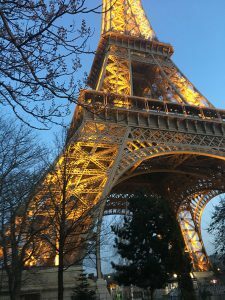 I was looking forward to touring Savoie University and seeing Eiffel tower. In fact, France was so overwhelmingly beautiful that I may have actually teared up a little. The country’s balance between pristine nature and extraordinary architecture left me speechless, and the food usually did the same. Throughout those two weeks, I began to understand why the French were so proud of their country. I’ve also learned that any sort of traveling is something that needs to be prepared for, no matter who tells you otherwise. bunch of complete strangers, and to my amazing host family. I hope to return to France one day and see everything I couldn’t see this time around. If you’re interested in studying abroad, or LCCC’s exchange programs you can call Cheryl Miltner at 440-366-4069, or through email at cmiltner@lorainccc.edu.